This was a custom order for an eight year old girl’s birthday. I hadn’t done children’s jewellery before (aside from some wooden surf bracelets for my boys! ), so this was an exciting project. The brief in keywords were something like, “punky, funky, pink & blacks, sort of goth-like, girly, dangly, with horse charms” – so I had quite a lot to work on! Firstly I had a look around the internet for horse charms, but nothing stood out, a lot of antique silver-plated type charms came up but nothing that I liked, or that I felt fitted the brief, so I looked to Twitter! On Twitter, I had recently made acquaintance with Vicky from StarsNScars who makes unusual and quirky jewellery using various mediums, and in particular plastics. Approaching Vicky, I asked if she would be able to make me some custom charms, including a couple of horses! I told her the colours I wanted and left her to it! When they arrived I was so chuffed! They were better than I could have imagined, and so different from other charms I had seen! 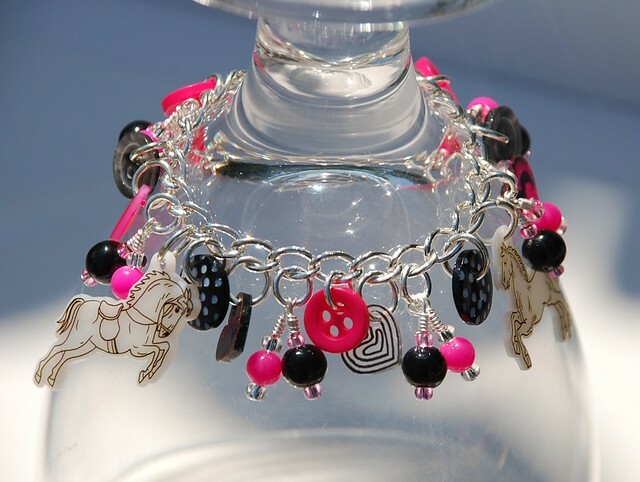 I immediately set to work in designing the bracelet around the charms, and used assorted hot pink, polka dot, and shimmering dark buttons. Amongst the buttons & charms were some little clusters of plastic hot pink & black beads with silver-lined crystal seed beads. I used a sterling silver charm 6″ charm bracelet chain with toggle fastening. I was so happy with how it came out, I wanted a grown-up version!! The little girl I was told loved it to bits, and you can see her on my facebook page in the “Fan Photos” section modelling it beautifully! I haven’t been in a creative zone for a while for many reasons, plus it’s hard to get time to make jewellery when you have a 15 month old toddler (and two other children!) – and when the toddler doesn’t sleep, the motivation to spend the evenings making jewellery is even harder! To ease myself back into creating something, I had a friend with a birthday coming up, and she needed a present! Unfortunately, her dear Mum had not long passed away, but after the funeral, I was honoured to be given a box of her buttons as a gift, many of which were vintage, which I love. 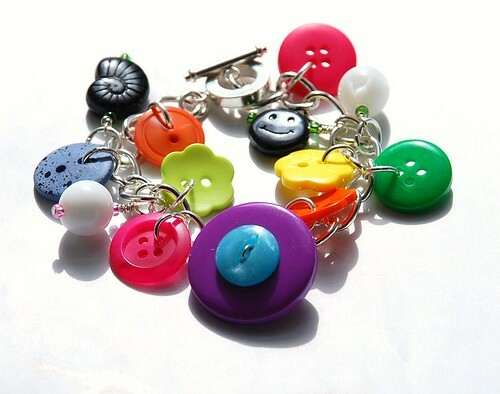 I felt that to make something for my friend using some of the buttons I was given would be a touching and fitting present, so I set about sorting through the stash to see what beautiful buttons I could choose! Firstly I found some larger semi-translucent greeny/turquoise buttons with shanks, and based my design around these. I interspersed these with a mix of pearly rectangular buttons, various silver coloured buttons, and some dark greys. 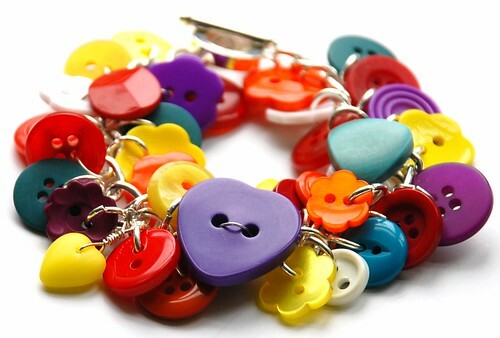 I was really pleased with how well the bracelet and the colours worked, particularly as I managed to just use her buttons and had no need to raid my own supplies, so knowing the complete bracelet was made entirely using her Mum’s (Cherry’s) buttons made it an even lovelier project to work on. Note: since the photograph, I did add a couple more buttons near the clasp! Although I was apprehensive when giving it to her, thankfully she loved it! It was a real honour to do something special that I knew would mean a lot to her. More photos can be found on my Flickr page. 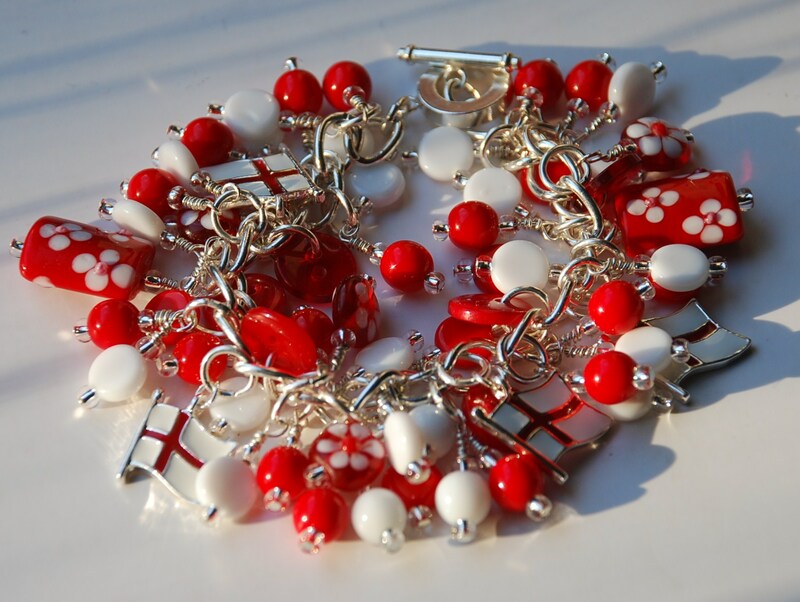 Quite a while ago, I was given an idea to do something “world cup” themed for the patriotic female English football team supporters. With World Cup season upon us, time to design & create these has been paramount! For several months, I toyed with various ideas and themes, and decided to try something feminine, yet substantial. 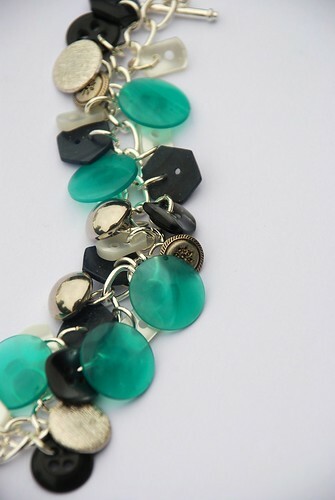 Something that jingled satisfactorily on the wrist when cheering the team on!! In my mind, it needed to be versatile so it could also be worn on a variety of other occasions. 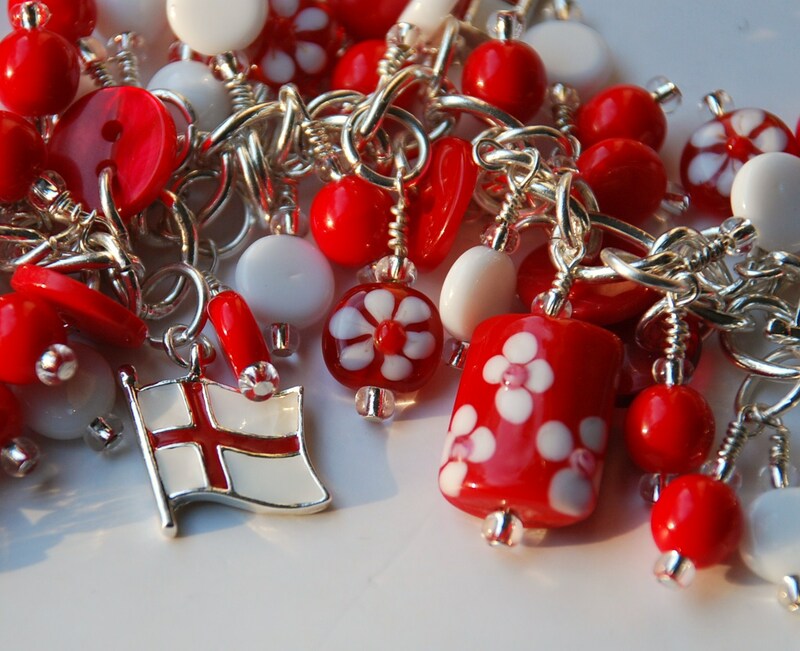 I wanted the bracelet to be suitably patriotic but not over-the-top screaming “England” or “football”, and hopefully the finished piece is testament to my ideas! The bracelet takes quite a while to make, but is ultimately one of the most enjoyable bracelets I have made to date, purely because it feels so gorgeous to hold (and wear!) 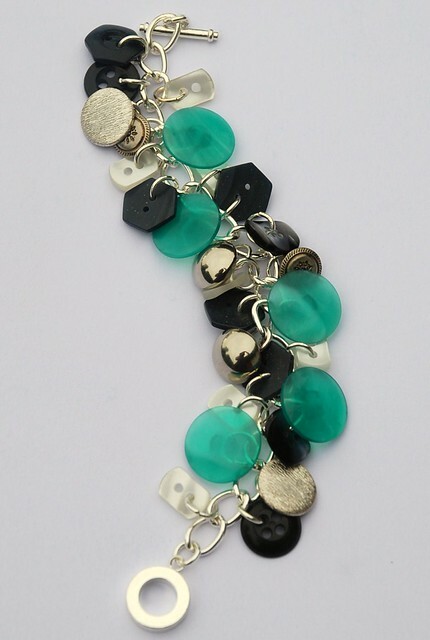 – the beads drape naturally and jingle so nicely against the wrist. I love the fiddly, long-winded (and nail damaging!) process of assembling each of the headpins with the silver-lined crystal seed beads, and watching the bracelet take shape. The finished bracelet weighs approx. 75g, and are approximately 19cm in length, so whilst it is delicate and feminine in many ways, it has weight and strength in it too! I have sold the first one already on Folksy (pictured), and am hoping some more supplies hurry up soon as I have at least another three more orders! Each one will be very similar to the original, but ultimately each will be individually handmade, and equally lovely! I have been lacking recently in what I always refer to as my “mojo”. I would sit and ponder how to make and create, and couldn’t find my creative side anywhere! Frustrating when you have orders to fulfil, and a desk covered in beads, buttons and various other jewellery making paraphernalia! Anyway, yesterday I wasn’t feeling very well, but I was given some time to myself, and when my headache started to subside a little in the afternoon, I found myself sitting creating finally! I managed to finally finish off two custom orders that I had started and put aside, and felt much more inspired again finally! I recently made a bracelet I was proud of. Dare I say, I love pretty much most of the things I photograph and try to sell, if I don’t love it, I don’t sell it. It’s that simple. 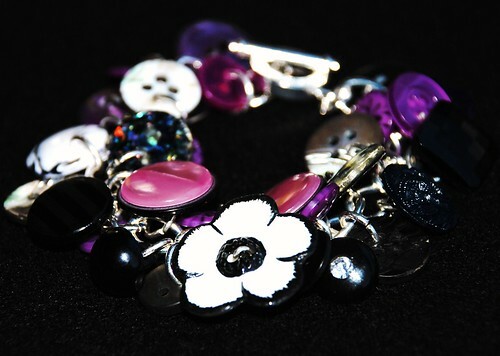 But, this particular bracelet I was quite captivated by, even when I was making it, I knew it was special. It took quite a while to collate all the right buttons that I felt worked with each other. 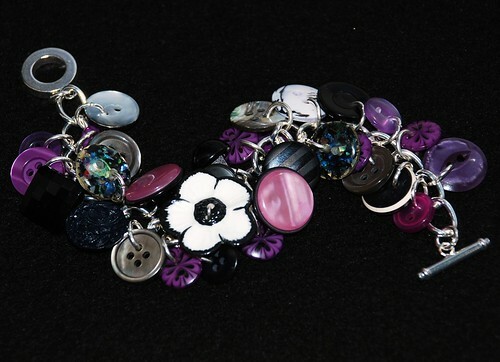 I have quite a substantial button stash now, but I have particular favourites, some are pretty unusual and have sentimental value due to where they came from…quite a few of my favourite buttons featured in this bracelet. I started giving my items “names” or an “identity” of some sorts, as it helped me keep track of what I was making, and I feel it gives each piece a personality or theme. With this bracelet, I couldn’t quite get a name I was happy with, until I sent out a message on Twitter and someone responded. Not just any old someone, a friend who had been through some real personal turmoil in her life, and in particular the last year. Her username inspired me immediately, and looking at the bracelet, it all fitted into place. The colours, the flower, the contrasts between dark, and light… and so “Jardin d’Eliza” – Eliza’s Garden, was “born”. 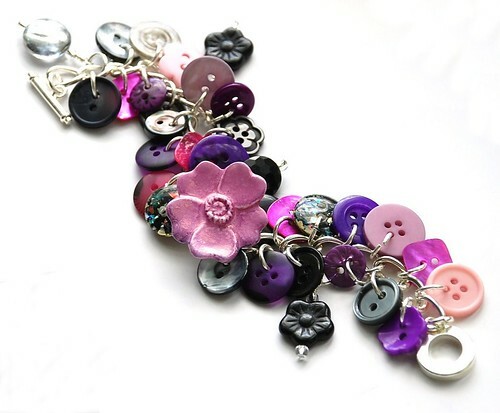 I listed the bracelet for sale on Folksy, and it sold within 40 minutes, and whilst I was happy to have a sale, there is a little part of me that could easily have kept it for myself! I am just happy it’s gone to a very lovely lady who I am sure will love it as much as I do.